1. Guard Your Numbers - Don't give out your social security number or bank account numbers over the phone unless 'you' initiate the call and know the person or organization on the other end. Never give this information to a stranger, even one claiming to be your bank. Don't write your personal identification numbers (PIN) down - memorize them. Refrain from printing your social security number or credit card numbers on your checks. 2. Report It Immediately - Lost or stolen checks can be blocked by your bank, just give them the numbers involved. Don't leave new check orders in your mailbox for extended periods of time and verify new deliveries are complete (assure none have been stolen). If your Debit card is stolen, contact us immediately at 1-618-241-6550. 3. Store in Safe Place - All cancelled or new checks should be kept in a safe place. Leave your social security card, passport, or birth certificate in a safe place - don't carry them with you. 4. Notify the Bank - If anyone suspicious calls asking for account information to 'verify a statement' or 'award a prize.' Banks have your account information and don't need to call you. BEWARE: Of fraudulent web sites and e-mails requesting personal information - refer to SPOOF web sites and phishing information for further details. 5. Guard Your Info - ATM personal identification numbers (PIN) and receipts are access tools for thieves. Don't write your PIN down. Keep them protected. 6. Mail Solicitations - Don't just throw pre-approved credit offers away, tear or shred them up so thieves cannot use them to assume your identify. Tear or shred any other financial information before it is disposed in the trash. 7. 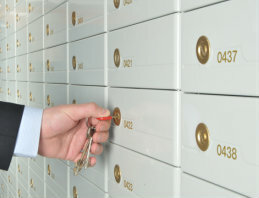 Mailbox Protection - Don't leave your mail in the mailbox for pickup. Drop them in a secure, official drop box of the U.S. Postal Service. Thieves could use your mail to steal your identity. 8. Bills in the Mail - As much as you hate receiving bills in the mail, be sure they are arriving on time. If not, contact the company to find out why. Someone may have put a false change-of-address notice on you to divert your personal information to another address for his or her access. 9. Review Bills Carefully - If they include suspicious items, investigate them immediately to head off any possible fraud before it occurs. Your Identity Has Been Stolen - What Should You Do? 1. Immediately contact your bank and credit card providers by calling the phone number listed on your statements.